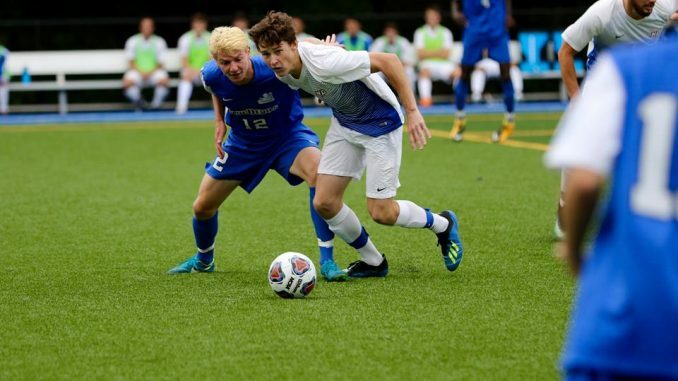 The State University of New York at New Paltz men’s soccer team’s season came to an end Wednesday afternoon, losing to No. 3 seeded the College at Brockport in the semifinals of the State University of New York Athletic Conference (SUNYAC) tournament. Hosting their first home playoff game since 2004, The Hawks never capitalized on their opportunities against the Golden Eagles. New Paltz out-shot Brockport, 11-9, and gained five corner kicks throughout the match, compared to the Golden Eagles two. New Paltz found themselves in trouble 18 minutes into the match, when a penalty in the box by fourth-year defensemen Brendan McGaley led to a Brockport penalty kick. First-year forward Matthew Stefaniw put one past fourth-year goalkeeper John Guzzo for the Golden Eagles, giving them the lead, 1-0. For the rest of the first half, the Hawks were on a mission to come back from the early deficit. At 34:57, a foul by Brockport allowed for a New Paltz free kick outside the 18. Third-year defensemen Luke Dole was able to get a head on the ball, but sailed the shot high. Exactly two minutes later, the Hawks made another run. This time, however, third-year Gordon Walker missed his header shot wide left. New Paltz did not force the Golden Eagles to make a save until 42:12, on a rocket shot right to the keeper by second-year midfielder Schuyler Mann. Things got scary for the Hawks at the end of half, when Brockport made a run of its own to force a corner kick with a minute left in the first. It came up unsuccessful, ending the half with New Paltz down, 0-1. The Hawks and Brockport each jabbed at each other once to start the second, forcing one another’s keepers to make saves within the first eight minutes of the half. For most of the second half, momentum was swung back and forth between New Paltz and Golden Eagles, as both teams found opportunities. Brockport’s biggest opportunity, however, came at 65:08, when Stefaniw capitalized again for Brockport, scoring his second goal of the game to give the Golden Eagles a 2-0 lead, and fully swung momentum onto their side. With Brockport dropping back to focus on its defense, the Hawks had multiple chances to put one in the back of the net themselves, racking up four corner kicks throughout the half. SUNY New Paltz never could, losing the match, 0-2. Concluding the season 11-6-1 overall, the loss marks the end of a historic season for the Hawks.